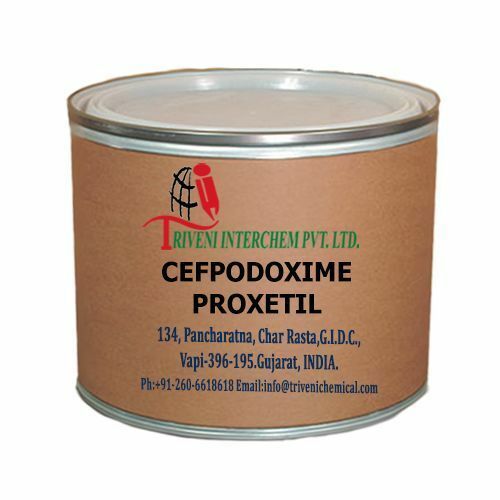 Cefpodoxime Proxetil 87239-81-4 Solid. it is use in antibiotics, bacterial infections Industry. Storage: Keep container tightly closed. Keep container in a cool, well-ventilated area. Waste Disposal: Waste must be disposed of in accordance with federal, state and local environmental control regulations. With experience in the chemical industry, Triveni Interchem P. Ltd has established a long track record of successfully manufacturing and exporting a wide range of Pharmaceutical chemicals. We are engaged in the manufacture and supply of chemicals used in Antibiotics API, Antidepressant API, Antihistamine API, Antimalarial API, Bacterial Infections API, Oncology API and many more. By pursuing & implementing the highest standards of excellence in our operations, we have nurtured our capabilities.